JK Audio is known around the world as a premier solutions provider for the radio and television broadcast industry. Award winning JK Audio products have been recognized for their quality and value for use in live broadcasts and interviews, as well as behind-the-scenes communications. JK Audio products are designed with a careful mix of customer suggestions, application knowledge, and the need to balance value with ease-of-use. These products meet and often exceed the demands of broadcast environments in urban and remote areas around the world. In addition, all JK Audio products are put through rigorous testing to ensure compliance to global safety, emissions, and telecom standards. The company was founded in 1992 by Joe Klinger, a life long Audio Engineer who found himself caught between telecom and broadcast industries. His years of experience included both live and studio music production, room and automotive acoustics, psychoacoustic research, loudspeaker design, and finally as an audio engineer at AT&T Bell Laboratories working with speech coding experts. While telecom is typically not the career path of an audio engineer, the goal was to bring telecom up to the quality standards of the rest of the audio community. This position placed an engineer in a Human Factors department as a technical liaison between psychologists and engineers. This is where you stop thinking like an engineer, and learn to design from the user’s perspective. His work at Bell Labs received patents in user interface design and signal processing. This mix of pro, consumer, and telecom audio experience identified a demand for easy to use, high quality audio interface products. The first “JK box” was called Telephone Handset Audio Tap, or THAT-1, which quickly found a home in telecom laboratories and radio studios, and eventually earned a spot in the Allied Broadcast catalog. THAT-1 was the seed that began development of over 40 specialized audio products. 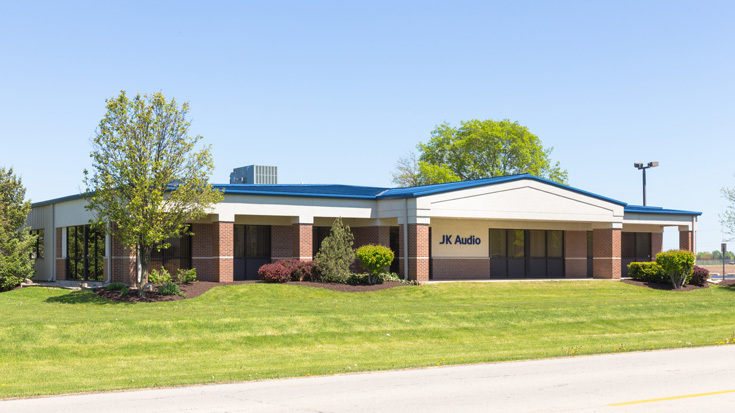 JK Audio grew quickly from its humble beginnings in a 200 sq foot rented office, to its current 12,000 square foot facility. The new headquarters were completed in 2006, with plenty of room to expand as needed. All areas of the company are built for success, from the friendly office and knowledgable support staff, to the experienced production department. JK Audio products are built at this facility in Sandwich Illinois, a small town just 60 miles West of Chicago. The majority of components and subassemblies are built in Midwest USA.